A regional weather forecaster has said that a couple of inches of snow could fall in parts of Waterford on Thursday as the country braces for disruption. Cathal Nolan from the Midland Weather Channel said: "Having analysed the latest weather models, there continues to be a substantial threat of some heavy falls of snow across many parts of the Midlands, East, inland Munster and Connacht." "An active Atlantic storm depression located to the south of Greenland is expected to track southeastwards, lying just off the southwest coast on Thursday before briefly stalling and sliding gradually to the east during the afternoon and into Friday morning. Its associated weather systems have the potential to deliver a considerable fall of snow." "At present, it looks as though the heaviest snow is likely to occur through central areas of the Midlands, inland north Munster and the East and Southeast. Initially, the heaviest snow will occur through Munster and Connacht during the early hours of tomorrow morning, before gradually transferring to more central and eastern areas through the late morning and remaining stationary for much of the day after," Cathal said. "There is a chance that any snow may briefly turn to rain for a small while during the middle part of the day, however during the afternoon and evening temperatures will gradually fall back once more and any rain will revert back to snow, with some heavy snow likely at this point through the east and southeast." 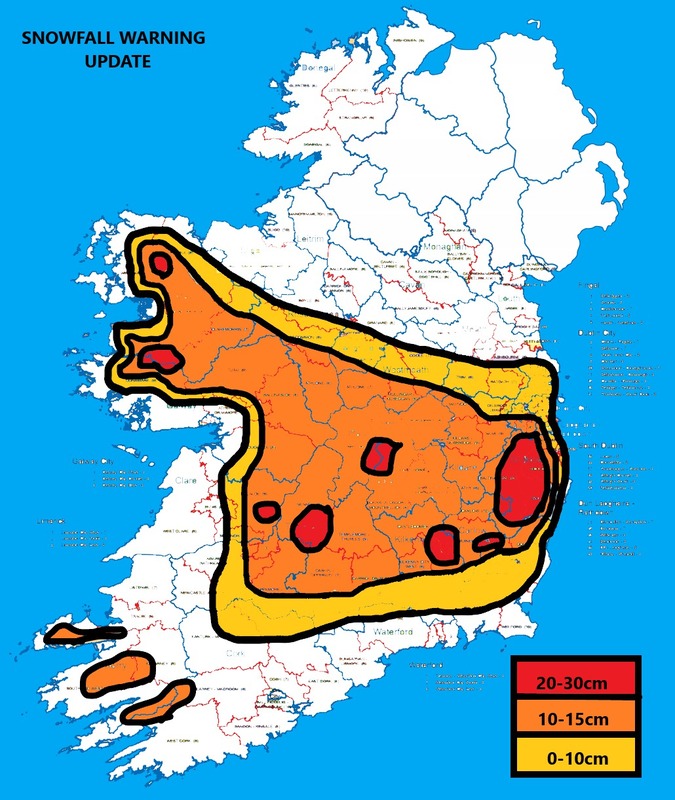 "Snowfall totals will vary quite considerably across the affected areas, with some areas in the orange zone seeing between 10-15 cm, while the heaviest snowfall will be reserved for higher ground above 250 metres," Cathal warned. He says the snow will come with strong easterly winds which may bring about temporary blizzard conditions, "with upland roads becoming impassable in many mountainous areas." Over higher ground, falls of 20-30 cm may occur, with some drifting likely, the meteorologist advised. "The situation does, however, remain marginal, with temperatures hovering close to freezing or just above, so continued monitoring of the situation is required." A status yellow Met Éireann snow and ice warning remains in place until Saturday afternoon.